Ed Brisson and Marcus To perfectly tap into the AGE OF X-MAN landscape that Thompson/Nadler have laid out. ALL HAIL GLOB HERMAN, MUTANT HERO. The next chapter in the AGE OF X-MAN is here with NEXT GEN. Ed Brisson and Marcus To show us what the students of this mutant utopia are getting themselves into. 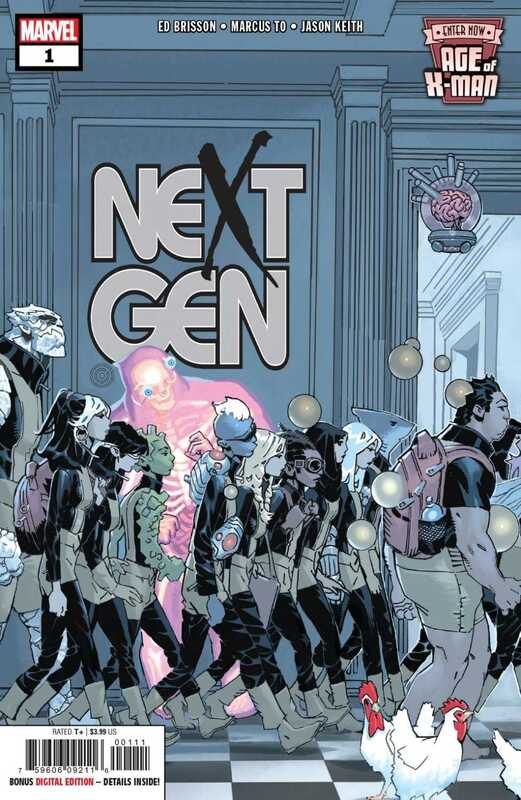 Writer Ed Brisson and artist Marcus To put the focus on the mutant kids. They’re all training and being educated for their future role in the mutant utopia. Some of them will be X-Men, some will be support or Department X, and some will be revolutionaries. It may be very early in the Age Of X-Man still, but the Stepford Wives-type horror underneath has been peeking it’s head out. Ed Brisson successfully taps into the landscape that Zac Thompson and Lonnie Nadler have planned out. 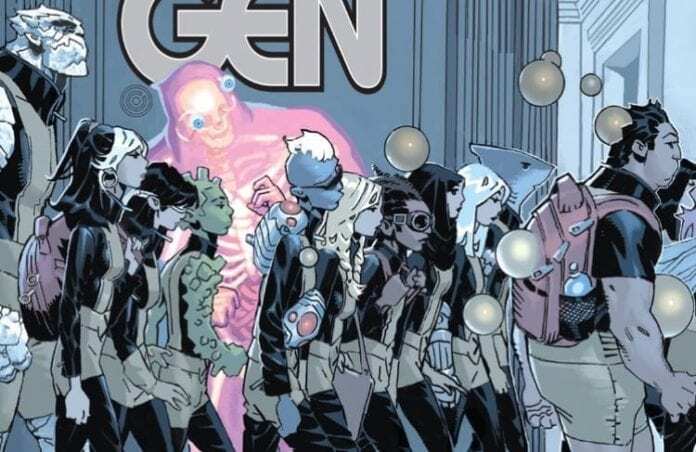 The story Brisson is crafting is one of conflict and terror as the future X-Men class slowly start learning the truth behind Nate Grey’s false haven. It’s a story we have seen before, but putting these kids through it provides a fresh, new shine. X-Men fans cherish these kids, especially Glob Herman. In Age Of X-Man: Alpha we saw that our beloved Glob had really seen some sh*t as he zones out while feeding his chickens. He’s the central focus of this story as he’s the only one who knows the truth and manages to keep from being mind-wiped. Glob Herman has been around since Grant Morrison’s New X-Men run, but we haven’t gotten enough of him as the driving force of a story. This Next Gen tale could finally give us the story we all want–the story where Glob Herman is the MVP hero of all mutants. Our tour through the various classes and divisions shows us the education and training the future X-Men are receiving. The slick transitions and dialogue bleeding into each page turn is clever and effective. All the subtle details give this issue a ton of character. Whether it’s the high school teasing, a quick hallway interaction, or the round of snap-applause the students give Psylocke. There’s a ton of charm and unique personality that makes this an enjoyable read. Longtime readers will appreciate not having to sit through introductions of all of these young mutants, the story jumps right in and keeps a fast pace. It’s also very accessible for new readers, we spend enough time with each of the students to get a detailed picture of what they each bring to the table. Marcus To and color artist Jason Keith do a wonderful job bringing these students and their various learning facilities to life. There’s so many unique and interesting characters filling each page. To doesn’t waste backgrounds with faceless human shapes. The tension and unease that develops once things start to unfold is palpable. A lot of story happens in the eyes of each character, especially our beautiful Glob Herman. Hipster Blob (wearing Wolverine’s costume from New X-Men) is another delightful redesign for this Age Of X-Man. Age Of X-Man: Next Gen #1 gets us started in a big way. The kids are probably not alright, but it’s going to be one hell of a ride. Ed Brisson and Marcus To paint a clear picture, one with a straight-up horror show just beneath the surface. The time has finally come for one of the best X-Men characters of all-time to take center stage. Perhaps for a short while, we enter the Age Of Glob Herman rather than X-Man. All hail Glob Herman, our beloved hero.